In 2015 LinkedIn Flagship Design, Product and Engineering teams have not only rebuilt the new Flagship app from scratch but we have taken everything you love and more to develop a mobile experience that is more intuitive, smarter and dramatically simplifies your LinkedIn experience. We know time is scarce, so we made it as easy as possible for you to connect to your professional network and stay informed about the conversations and content most relevant to you. Home is content from your network to help with your professional day. It’s based on what we determined is most relevant for your industry, function, and skills combined with what conversations and content you care about. For the first time, as part of a lightweight onboarding process, we are going to ask you what content you are interested in, and over time you can also unfollow things that are less valuable to you. your profile, who is commenting on, or sharing your posts. It also offers the most intuitive way of updating your profile that we have ever had, so you can easily spruce up your professional profile to keep things fresh. My Network is a daily briefing of what’s happening in your professional network, so you can see in seconds people you may know, new posts from your network and suggestions to keep connected. For example, it will offer prompts to say congrats to a connection celebrating a new role or work anniversary, or send a message to someone in your network when they have written a post on LinkedIn. By syncing your calendar it will also help you get smart for your next meeting. You’ll be prompted to look at the profile of the person you are meeting with that day with details on what shared connections or shared interests you have. This way you can avoid the small talk and have a meaningful conversation. 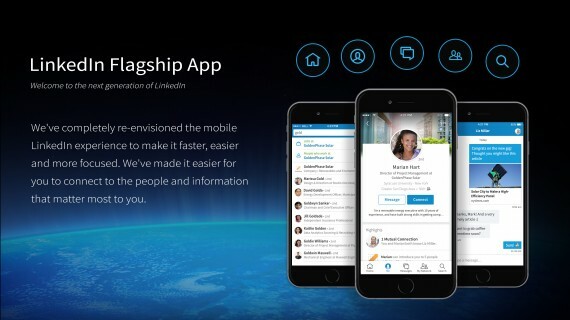 LinkedIn mobile experience is available globally to help millions of members to stay ahead of their professional world.